Growing up in a family that loves Disney, we always had favorite characters. Of course, they would change depending on my age when I was little. 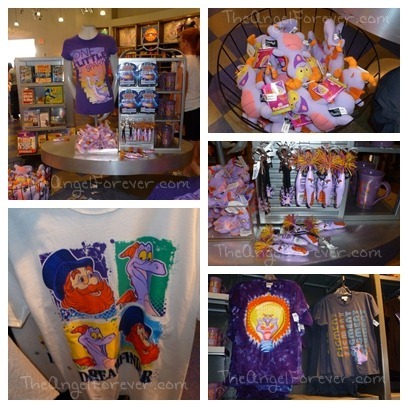 I loved Mickey, Donald, Goofy, and then the year Epcot opened, I feel in love with Figment. He was just the cutest thing, especially when paired with Dreamfinder. Once I was in high school I feel head over heels in love with a positively pessimistic guy who stole my heart. 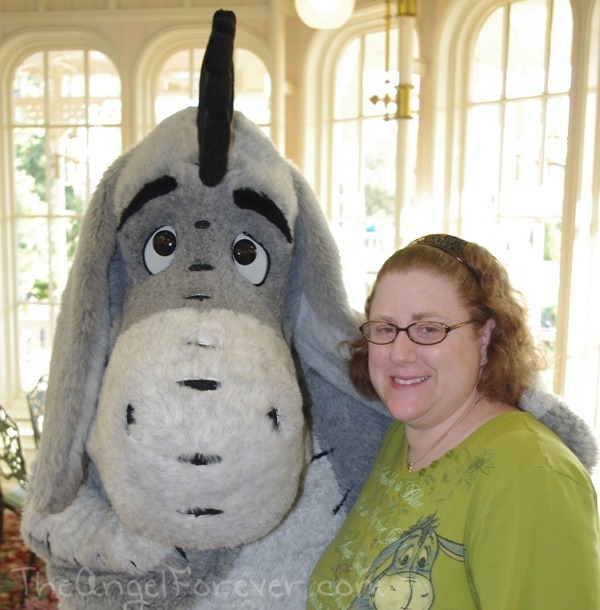 I collected Eeyore items at the Disney Store, Disney World, and he had a special place in my classroom as well. 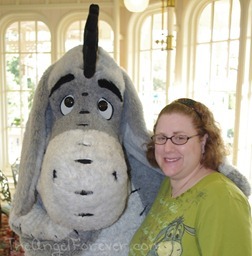 Here is a photo of me with Eeyore at The Crystal Palace breakfast last year. I thought it would be fun to see who the boys like these days. 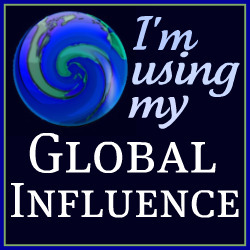 TechyDad will be writing a post about who he likes this week. A few months away from his fifth birthday, JSL took no time to reply. He immediately shared his love for Buzz Lightyear and Tigger. How funny that I have a photo of him chatting with Tigger from our last trip while wearing his favorite Buzz Lightyear shirt. 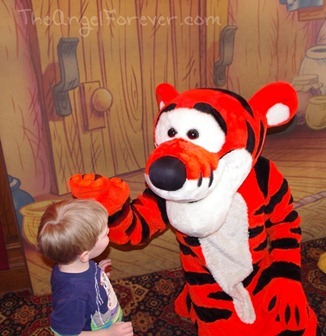 I think JSL has a special place in his heart for Tigger since he was the one he connected to on his second birthday at The Crystal Palace. 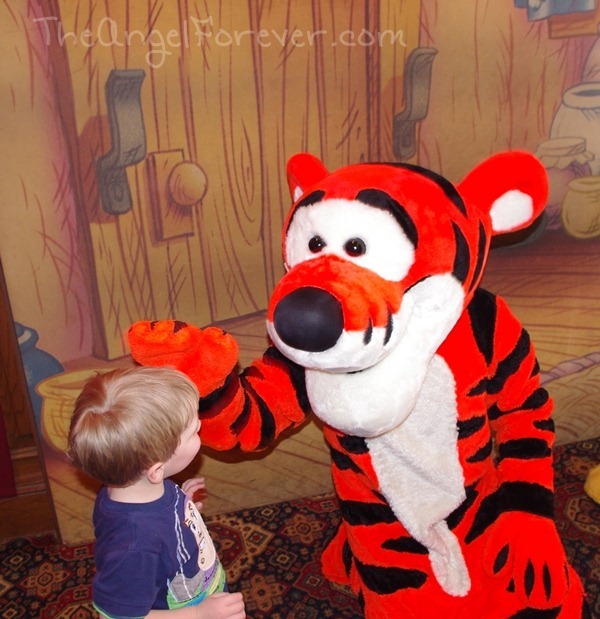 Prior to Tigger letting JSL honk his nose, he was very much afraid of the characters walking around the parks. NHL was not as quick to list people. He mentioned several characters from Phineas and Ferb. I know he can not wait to meet the title characters at Hollywood Studios. Last time we were there, they had not moved into their new home at Walt Disney World. Then, NHL surprised me and mentioned Piglet. 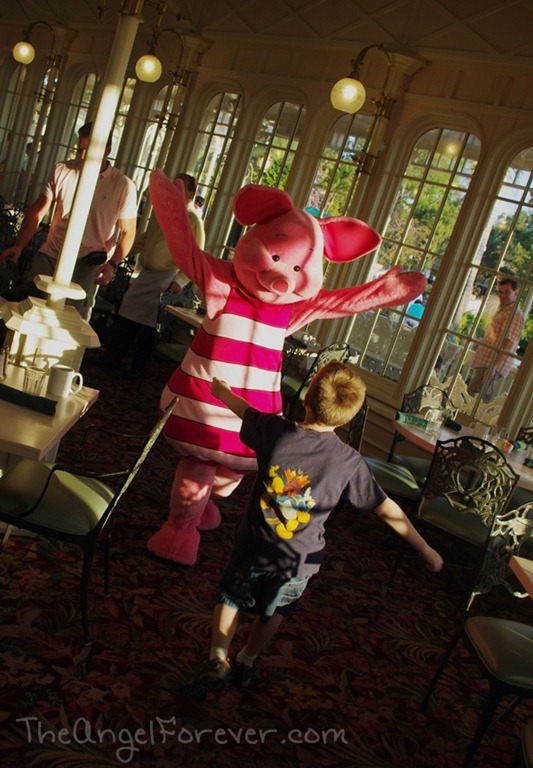 I think this is again from our first trip in 2009 when the boys really liked the easy going nature of the characters at The Crystal Palace. The second character he mentioned was Captain Hook. Of course, once JSL heard this – the pirate was added onto his list as well . 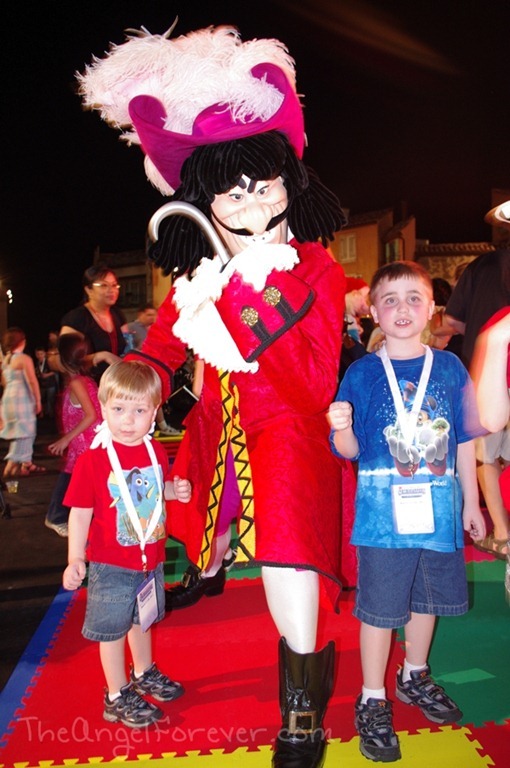 . . along with others from Jake and the Never Land Pirates. No doubt that another adventure to Walt Disney World will change some of these favorites or add on many more for the boys. 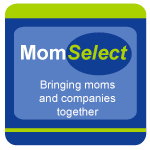 So, who are your favorite Disney characters and why?